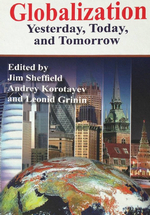 Globalization Yesterday, Today, and Tomorrow / Edited by Jim Sheffield, Andrey Korotayev, & Leonid Grinin. Litchfield Park: Emergent Publications, 2013. More.